Why should you choose us? What do we offer? You can search for available flats for rent with the help of our 'Apartment search' engine below. If you are interested in an apartment, please contact our office and we will gladly arrange an appointment for you, and one of our colleagues will accompany you to the property! If you have an apartment for rent which you would like to advertise on our website, please please contact us and we will be happy to help! You can advertise your room for rent free with us here! Enjoy surfing on our website! Szigetiváros- 5-10 mins walk from the UNI, quiet neighborhood with green sorroundings. Many new apartment complexes can be found in this area. Egyetemváros- 5-10 mins walk from UNI, between the UNI and the city center. Flats are mainly in 10 story buildings, made of beton, with central heating. Belváros- The historic city center of Pécs, with shopping, dining, bars, and entertainment. 15 mins by bike or bus to the UNI. Mostly consists of older high ceiling historic buildings or brand new brick apartments with gas heating. Mecsek- The hillside of Pécs, with regular bus schedules. Most Pécs residents like living on the Mecsek since it is far from city noise and most apartments offer a nice view of the city as well. Ispitaalja- South of the historic city center, but still considered the center. Quiet area, close to the train station. Uránváros- West side of Pécs, offers cheaper accomodation, brick apartments with gas heating can be found in this area (low utility costs), found 10-15 mins walk to UNI. Budai- East side of Pécs, min. 15 mins by bus or car to the UNI. Kertváros- The suburbs of Pécs, consisiting of beton flats. Car or bus is preferrable as means of transportation, which takes 15mins+ to UNI. Nagyerdő- next to the faculty of medicine, quiet green neighborhood with a forest, lake, punter, amusement park, zoo, near the soccer field. There are mainly 4 level apartment complexes, luxury apartments and houses in this area. 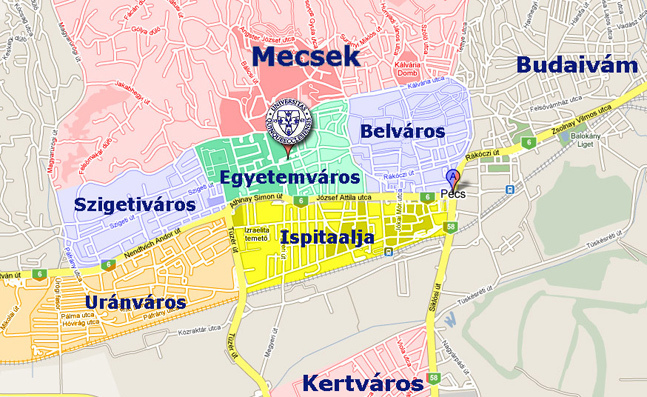 Csapókert- 5-15 mins from the Campus Hotel, sports pool, Főnix arena, the faculty of business, law, and engineering. This suburb consists of mainly houses, but there are also 4 level apartment complexes near Kassai str. The city center is 15 minutes away. Dobozi lakótelep- 5 mins from the faculty of engineering, there are 4 level apartment complexes in this region. The city center is 10 mins walking distance. The faculty of law is 3 bus stops by trolley-bus. Újkert- 5 -10 mins. from the faculty of agriculture, about 15 mins from the faculty of medcine. Has mainly 10 story flats, mostly renovated with modernized heating systems. Frequent buses, where the city center can be reached quickly. Excellent bus trafic, the busline will take you to the train station as well. This region has lower priced apartments. Vénkert- Close to the faculty of agriculture and the faculty of medicine, with excellent bus traffic. This is an older region of Debrecen with 10 story complexes, lower priced flats. 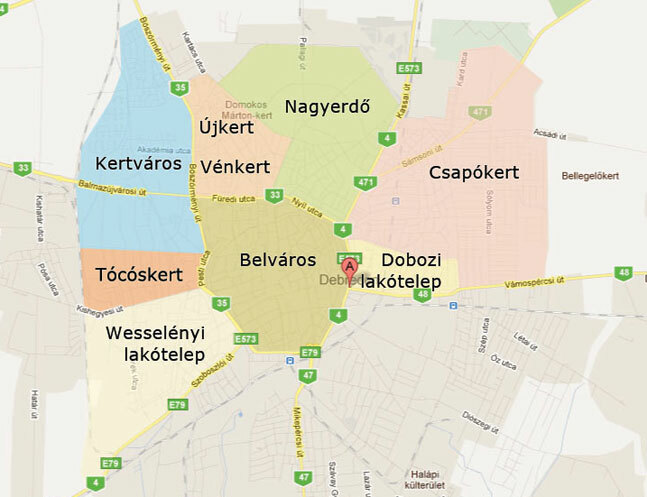 Belváros- This is the historic city center of Debrecen, close to entertainment, shopping, and dining. In Péterfia street you can find the faculty of education. The faculty of medicine is easy to reach by tram, trolley-bus, or bus. The faculty of engineering, law and business can also be reached by the same means within 15 minutes. Kertváros- Upscale suburbs of the city, near the faculty of agriculture. The faculty of medicine is 15-20 mins away. There are higher priced condominiums, houses, and apartments in this region. Tócóskert- Lower priced flats in 4 and 10 story buildings near Tesco. This area is further from the UNI, but has great transportation. Wesselényi Lakótelep- 10-15 mins from the train station and trolley, this area has nicer flats in 3-4 level buildings. The city center is 10 mins away.